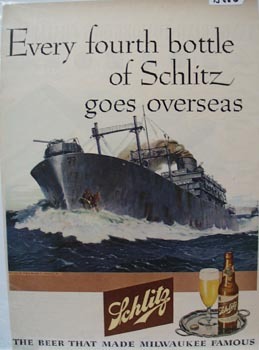 Schlitz Beer Goes Overseas Ad 1945. This is a February 26, 1945 advertisement. It is a nice color ad for Schlitz Beer. Pictures a battle ship on the ocean and it reads, Every fourth bottle of Schitz goes overseas. In mint condition. This photo is taken through plastic and may show wrinkles or crookedness that is not in the ad. This magazine tear sheet measures 9 1/2"" wide by 13 1/2"" tall. Items Similar To "Schlitz Beer Goes Overseas Ad 1945"